In this episode, Carrie & I discuss online reviews. We know how important they are to any business. Carrie recommended a service called GetFiveStars.com. Learn more about what to look for an online review service on Carrie’s recent blog post: Online Review Services – Are YOU Benefiting? Carrie Hill discussed the 3rd party review sites vs. online reviews on your own site. Both are needed, but it’s also important to find niche sites that work for the appropriate industry. There is no one-stop place to add reviews. Businesses need to take a diversified approach. Cultivate and grow reviews on various sources. The negative reviews will come, but getting positive reviews requires a proactive approach. Hashtags have become commonplace in social media conversations.They seem to be used everywhere. People can now search Google using hashtags to find Google+ content – another benefit of posting on Google+. In other words, not only are Google+posts indexable but so are Google+ hashtags. If you were not using Google+before, you have one more incentive to do so. Google continues integrating its products and services. A recent integration includes adding Google+ hashtags into their search results, which is a step beyond what other social media platforms have done. Google+ content that used the #marchmadness hashtag is displayed on the right side, prime real estate, whereas regular search results are listed on the left. Interestingly, at the Google+ results is the option to search Twitter and Facebook. The Google+ results are presented in a scrolling fashion but can also be viewed using the arrows. The number of +1’s and other post activity can be seen. Clicking on a result will send a person to a Google+ page with current results of posts using the #marchmadness hashtag (image 1). Clicking the link to the person or brand that posted the link will take a searcher to the respective Google+ profile (image 2). Only posts that have been publicly shared or shared with the person searching will appear so privacy controls remain intact. Brands should post content on Google+ and use relevant hashtags in their posts. With this recent integration, relevant hashtags amplify a brand’s content beyond its followers and becomes another way to have its social media content discovered by people via Google search results. Who doesn’t want to be discovered? Hashtags can be used in a variety of ways: campaign, brand, trending, niche trending, content, event and location. A brand’s goals and content will dictate which ones to use. But do not go overboard with tags or the post will look spammy. Hashtags are now included in an expandable list of three items in the upper right corner of the post. Hashtags in gray are manually created whereas the ones in blue are auto generated by Google based on the post’s content. While a hashtag is being manually created, Google will autosuggest other tags. For example, typing “#socialmedia” may generate the suggestion “#socialmediatips,” which could be a more relevant choice than the generic tag. Only using generic tags will cause a brand’s message to be lost in the noise and target too general an audience. Any unwanted tags in the list can be removed. If more than three hashtags are used, use the most important ones first. Clicking on a hashtag takes a person to related posts that used the particular hashtag and even related hashtags for more in-depth exploration. As this feature is still fairly new, its potential success is unknown. The number of people who search by hashtag will determine the impact it has on brands. Even if it does not fully live up to expectations, the indexability of Google+ posts provides numerous benefits to justify a Google+ presence. Meanwhile, tag it! In a prior post, I discussed optimizing Facebook for SEO. As we’ve seen, what you do in social media has a direct effect on how (or if) you are found in search results. Not only does what you do in Facebook matter, Google+ also has a role in search engine results. They are both a big part of the social signals in search. In 2011, Google announced that Google+ public posts will begin showing in search results. Similar to Facebook’s social influence on Bing, the Google+ integration will show you when your “friends” have shared a story or link. Link to all other profiles. Make Google+ your central hub for all your accounts. This allows Google to make an easier connection on who you are and where you are located on the web. The same philosophy applied to page optimization works with Google+ as well. Although Meta Description has little affect on rankings. A good meta description will show in search results and will result in a higher click-through-rate. Search engines love fresh content. Google+ is no exception. Use and Optimize Every Field. The more information you add, the better your chances of being found. What happens in Google+ matters to Google. That means that all posts are relevant and can show up in search results. Best keywords practices should still apply. Good content leads to more sharing. If you develop something worth sharing, it will be shared. Ultimately, it all matters. Google+ is one aspect of SEO. It can save you or break you, but every little step matters. Google+ should be a part of your SEO plan, is it? Google has just announced a few exciting improvements to Maps that will make it more of an interactive and personalized experience, as well as where search ads will appear within Maps. Using location extensions in Google AdWords has always been an important element of PPC marketing; not only is a quick and easy way for customers to find your location and contact info, it increases click through rates. At Google’s annual developers event this month, they showed previews of testing that will display search ads within Google Maps, instead of next to the Map. Search ads with location extensions will appear on the Map, below the search box, and ads without a location extension will appear below the search box. The preview below shows that there is significantly less space dedicated to ads compared to Google Maps today, so I’m anxious to see how it will actually look when the update goes live. The other major update Google announced is that Maps will be uniquely created and adjusted based on an individual’s search habits and off-line preferences. With every click or search a user makes, Google Maps will draw a unique Map of locations that the user has searched along with new locations that the user may be interested in that they haven’t yet thought to search for. The first step is for the user to set important locations like home and work, a few favorite locations that are starred, and places that the user has reviewed. In addition to the customized search results, Maps will also display businesses such as restaurants or stores that friends have recommended on Google+ and other user’s reviews and ratings. The more that the user interacts with the Map, the better and more personalized the Map becomes. Location extensions and individualized Map updates provide an opportunity for businesses to both stay connected with customers and get in front of new ones, are you ready for the update? If you haven’t already, create a Google+ Page and start using it. Ask your customers to add reviews and actively add updates along with high quality photos. Google does index Google+ pages and posts, so we know that it will become an even more important piece of the ranking puzzle with updates like this for Maps. Maps will also integrate high quality imagery and the ability to “fly through cities, walk canyon trails, climb mountains and even swim the oceans” by integrating 3D experience. There haven’t been as many Google Maps updates as there have been to the other products, so I’m very excited to see how Google connects users with new locations and what info it brings into rank and offer suggestions. It will also be great to see high quality photos (meaning hopefully they aren’t all from Flickr) as well as 3D tours of places that we might not be able to see in person, all in one place. What do you think about the Google Maps updates? If you could see any place in the world in 3D, what would it be? Give people what they want and they will (Google+) hangout with you! One constant in any marketing strategy, whether it be in the format of print, email, website, or social media is providing targeted content to a targeted audience … AKA – Giving people what they want. If you (a brand, business, marketer) provide it, they (your customers, brand ambassadors, industry influencers) will soak it in, like it, and hopefully share it. How does this apply to the shiny widgets on Google+? Google+ provides an opportunity for brands to connect with their audience in a unique, interactive way via “Hangouts” and “Hangouts On Air”. As a marketer, this opens up a whole new platform for connecting brands with their audiences, but also provides an opportunity for companies to show their personality and go “behind the scenes” for those interested in a deeper connection to a brand than just an ad or email offer. What are the trends for marketers and brands with Google+ Hangouts? Interested in playing with Google+’s Hangouts On Air? Today Google announced a major change to search engine results, and this is probably one of the most significant changes I’ve seen to Google in quite a while. The new “Search Plus Your World” features begin rolling out immediately. The idea behind this new feature integrates traditional search results with shared items from a user’s network of friends. Google’s new Search Plus Your World will have a new “Personal Results” view that will be shown to users by default. These “personal results” will be tailored results based on Google+ shared content, personal web search history, online habits as well as social connections. For those that have been following my series on social signals in search, this should not be a surprise that Google is “all-in” with Google+. People and Pages, which help you find people’s profiles and Google+ pages related to a specific topic or area of interest, and enable you to follow them with just a few clicks. Because behind most every query is a community. 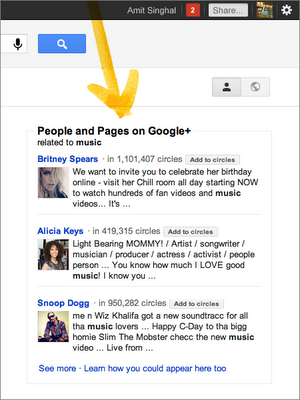 Google+ people suggestions are also integrated into these new search results. If users search for broad topics, like music, Google will show what it considers “prominent people who frequently discuss this topic on Google+”. Again, Google is gauging social authority from Google+, so of course Google is only pulling these “prominent people” from Google+, not Facebook or Twitter. As we know, that’s a substantial less amount of people. To stay that Google is showing special bias toward Google+ is a big understatement. 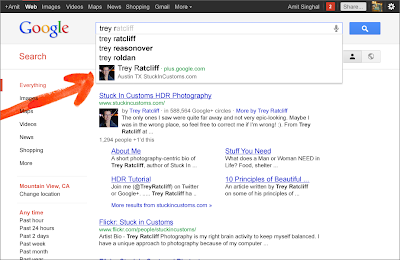 As another sign that Google is pushing Google+ hard, they are also adding people’s profiles to search. This will give a whole new meaning to “Googleing” someone. By typing the first few letters of a name, Google will auto-complete the name based on the network of friends. See example below that Google provided, since it has not rolled out to me yet. An even more interesting move, this new feature is not indexing Facebook as deep (nor did it ever). However, that’s more likely a Facebook problem than a Google problem. Facebook’s term of service don’t allow for search to crawl to deep within the site. That’s great from a security and privacy aspect, but not so great if business wants Facebook content ranked well. Google+ shares almost everything (also a good and bad thing), and they’ve made that clear from the beginning. See the video below to learn out about Search Plus Your World … and paperclips.